Have you ever been enjoying a tasty glass of wine and after that realized you have half the bottle still left? You don't feel like consuming more at that exact minute, but have that sinking feeling that you're about to lose the rest of that lovely bottle of goodness ... It may seem odd being so passionate about a little wine tool like this Sip & Save, but when I discovered it I had no idea such a thing in fact existed! I could not believe there was in fact an option to saving my wine and it still being fresh some days later. After going to Napa Valley a couple of years back my hubby and I simply fell for everything wine related and ended up being genuine wine enthusiasts. So I can not consume a flat tasting wine like I used to. I 'd put a stopper on the wine (occasionally if I had one), but it was no use. When I saw such a wine saver in Temecula on a winery tour some months back, I chose to order one on Amazon. There were a couple of to choose from, but this one being made of stainless-steel, it appeared high quality and truly basic! I was right. I simply love this wine too and use all of it the time! What an excellent, small purchase this was and so far I have actually bought and given a number of away to all my wine loving good friends and they're simply elated with it! I motivate you to click the link below and order your now and see! The Sip & Save vacuum wine saver extracts air from opened wine bottles to slow down the oxidation process and keep wine fresh! 2 push-button wine stoppers are to seal your bottles in an appealing gift box. This specific wine saver is a vacuum wine preserver that will keep your wine fresh and filled with flavor for longer! It is a wine sealer that allows you to keep and enjoy your opened bottle and allows you to not lose any more wine. 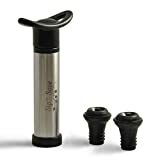 The stainless-steel, ABS plastic and silicone composition, make the Sip & Save a high quality wine toy. It is exceptionally simple to make use of and simple to clean (dishwasher safe) and the instructions are really basic. It's a superb, small and basic wine accessory that should be in every wine lover's collection.